This is a basic crepe recipe but the secret is in the preparation. You can fill it with anything that you can think of but here in Colorado we love berries and yummy marscapone cheese. 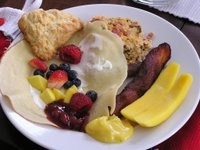 Here is a photo of the fabulous crepes that Amy served last Christmas Day for brunch. Yummy! Combine milk, flour, egg, sugar and 2 teaspoons butter in a blender - blend until smooth. Put the batter in a covered bowl in the refrigerator for at least 30 minutes but up to one day. Lightly brush a 10-inch nonstick skillet with butter, then heat over moderately high heat until hot but not smoking. Cook crêpe until just set and golden around edges, 10 to 15 seconds. Loosen edge of crêpe with a heatproof plastic spatula, then flip crêpe over carefully with your fingers. Cook until underside is set, about 20 seconds more. Put crepes between wax paper to keep from sticking. Cut up berries and put out topppings and serve!